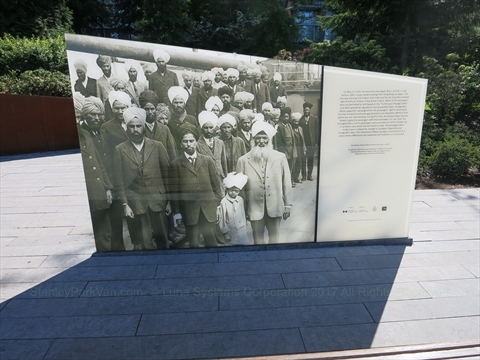 The Komagata Maru Monument is a monument to an incident which happened in Coal Harbour in 1914. The ship, Komagata Maru, arrived with Indians from India who were refused entry to Canada. The names of those on the ship are in enscribed in the monument. On May 23, 1914, the steamship Komagata Maru arrived in Coal Harbour after a seven week crossing from Hong Kong via Japan. The ship was carrying 376 Indians from India and the Far East who claimed right of entry as citizens fo the British Empire. Most of the passengers were not permitted to land based on the "Continuous Passage Order" and other prejudicial regulations that prevented Indian immigration. While supporters campaigned for the passengers' right to disembark, the ship remained anchored approximately one kilometre offshore from where you are now standing. During this time, the Khalsa Diwan Society helped supply the passengers with food and water. On July 23rd, the Komagata Maru and its passengers were escorted out of the harbour by a Canadian Navy vessel and sent back to India. The Komagata Maru incident was a catalyst for change to Canadian citizenship and immigration laws. This monument reflects Canada's commitment to a nation where differences are respected and traditions are honoured. Donated by: Khalsa Diwan Society, Vancouver, and B.C. Historical Recognition Program with the support of the Vancouver Board of Parks and Recreation. 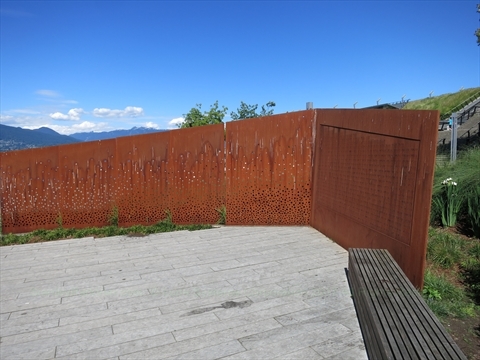 Where is the Komagata Maru Monument in Coal Harbour?